An impression of what the bridge will look like. An international team of students led by TU/e plan to build an ice bridge reinforced with paper fiber. The 100 meter long bridge, based on a design by Leonardo da Vinci, will have a span of 50 meters – the longest open span ever built from ice. If the task succeeds, the bridge will beat the earlier world record set by a group of TU/e students in 2014 with a 30 meter ice dome. The team presents its plan today. A total of around 100 students and volunteers will travel to Juuka in Finland this winter to build the huge bridge. Construction of the foundations will start at the end of December in Finland, and bridge should be completed in mid-February 2016. The universities of Leuven, Aalto (Helsinki), Ghent, Bath and Edinburgh also intend to contribute and build their own ice structures, which together with the bridge will provide a big ice spectacle. Last winter (2015) students from Eindhoven already built a 30 meters high church, based on the Sagrada Familia, and the year before they constructed world’s largest ice dome, 30 meters wide. These projects too are based on ‘pykrete’: ice reinforced with wood or paper fibers. The bridge is built by spraying thin layers of water and snow onto a large inflated balloon, and then letting it freeze. Layers snow and water with ten percent paper fibers, are sprayed alternately. The water-fiber mix is then immediately absorbed by the snow, and it all freezes together. The addition of fibers makes the material three times as strong as normal ice, and also a lot tougher. The builders will work in shifts, 24 hours a day in the freezing cold. That’s because the equipment would freeze if the work was stopped for too long. 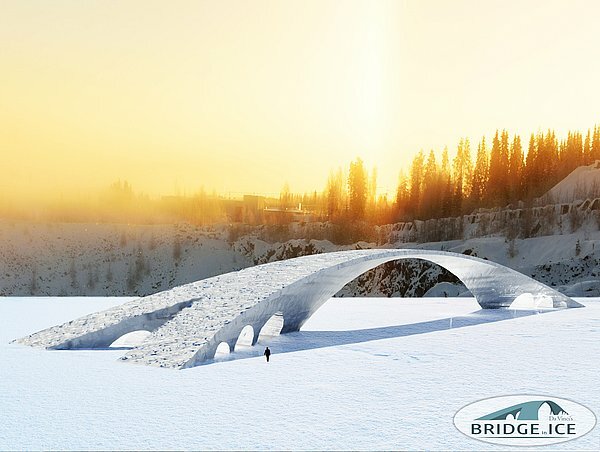 The ice bridge will be built in a 70 meter deep old quarry. The students will allow water to freeze on the walls of the quarry, creating a kind of ‘ice arena’. Just as in past years, the ice project is expected to attract thousands of visitors.